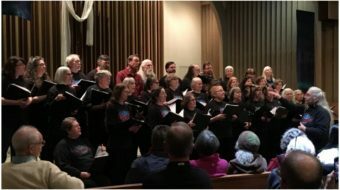 WASHINGTON – A coalition of progressive groups, led by the AFL-CIO, will unveil a joint platform this summer to foster long-term reconstruction of the economy. They’ll also demand that candidates support it in order to get their (and their members’) electoral backing, federation President Richard Trumka says. Trumka disclosed the coalition’s existence in answering a question after his May 9 speech to the Center for National Policy, a national security-oriented think tank in D.C. Center President Scott Bates invited Trumka to talk because, Bates said, the state of the economy – and lack of income equity in it – is a national security issue, too. 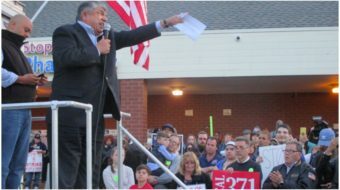 Trumka did not give details of the eventual “agenda for America,” adding, “We’ll be wheeling it out in early July.” But he spent much of the speech, on the topic of reviving U.S. manufacturing and its relationship to national security, outlining what sounded like the federation’s priorities for that platform – most of which he has announced before. “We’ll tell candidates about this agenda that creates an economy that works for everybody. And we’ll use it to support candidates now, and recruit candidates in the future,” he added. Trumka admitted, to another questioner, that enacting the program would be difficult unless the groups both elect progressive lawmakers and then hold them politically accountable. That’s the point of the labor federation’s re-crafted political program, he said. One of them was government encouragement, and boosting of domestic manufacturing, through R&D, tax incentives and other methods. Creating well-paying factory jobs has been a constant fed theme for years. Trumka extended that to factories’ supply chains. His example was in the U.S. auto industry – whose business accounts for one-fourth of all manufacturing. It’s revived, and Trumka lauded President Obama for stepping up on that. Setting “strong manufacturing goals,” for the U.S., as other nations do, was another item. Specifically, Trumka said the nation should “add four million factory jobs and balance its trade within five years,” and have factories produce 18 percent of gross domestic product. The trade deficit is over $600 billion yearly. Data show factories gained 350,000 jobs in the last two years, but lost six million jobs and 54,000+ factories in the prior decade. Another item: Telling government leaders “to shed the notion that austerity is virtuous.” Such budget cutting is a GOP mantra and even Obama has adopted it at times. “We should resist this when austerity means starving the economy of public investments” in infrastructure, education at all levels, and technology, specifically broadband, he said. Specifically, the U.S. should think big on highway and mass transit investment, he added. That means not the “small-bore” highway bill now subject to congressional wrangling, a two-year $106 billion measure. “Unions provide strong job safety protections, and we’re the biggest provider of adult education” in the U.S., through apprenticeship training, Trumka said. “In every other successful economy, unions can demand and negotiate pay increases that lead to increased demand that leads to growth. That’s no longer the case in America,” he said. That means changing the National Labor Relations Act and the Railway Labor Act, the latter of which covers workers in airlines and railroads, and bankruptcy laws, Trumka said. 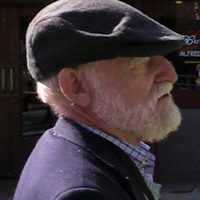 He called both labor laws “antiquated.” The RLA takes away the strike as a weapon and does not require mandatory arbitration, giving firms more incentive to stall. As for the NLRA, “literally, a first-year law student” working for an anti-union firm “can delay (representation) elections for five or six years,” Trumka, who has a law degree, said. 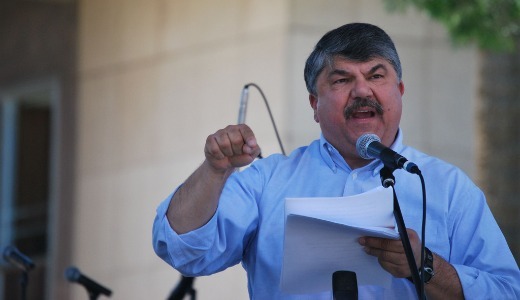 Trumka also said his brother-in-law worked for 34 years as a mechanic for United Airlines before retiring. Several years later, United declared bankruptcy and “he lost his pension,” Trumka said. The United plan was transferred to the federal government. Bankruptcy lets firms “shed themselves of health care and pensions,” Trumka stated. Reversing moves to exclude people from political participation is another goal. Trumka said 34 states are trying to enact laws to toss out voters, from voter ID to bans on voter registration drives. He singled out Texas for shortchanging Latino voters, even though Latinos provided all its population growth. He cited another form of disenfranchisement: partisan, convoluted redistricting, where lawmakers choose their constituents. Trumka, who votes in Pennsylvania, said its legislature threw him into a congressional district that extends like a stringbean halfway across the state. “It’s tough to figure out who your rep is. And both parties are guilty of this,” nationwide, he commented.